Dubai, UAE, July 10, 2018: This year’s 25th annual Tour of Slovenia was exceptional in every sense. Through Eurosport broadcast and social networks, we brought the I Feel Slovenia brand to the world and presented Slovenia as an amazing green country with friendly people and several landmarks worth seeing. This year, the organisers of the Tour of Slovenia decided to present the award for the best host of this international event, as the atmosphere throughout all five stages added to the attractiveness of the race and the promotion of Slovenian tourism. This year, the organisers of the Tour of Slovenia decided to present the award for the best host of this international event. The competition was open to all hosts of starts, flying starts and finishes, as well as the destinations which the race passed through. This included 28 municipalities. By doing this, the Slovenian Tourist Board (STB) aimed to increase the attractiveness of the race, particularly during its live broadcast on the Eurosport channels, as well as the country’s recognisability as an excellent destination for sports events and active holidays. The competition was held for the first time and took place in two rounds. First, representatives of the media who were present at more than one location of the race cast their votes. Celje, Kamnik, Murska Sobota and Rogaška Slatina (listed in alphabetical order) received the highest number of votes. The finalists were then assessed by a special expert jury that selected Kamnik as the Best Host. The jury explained that the fans created an amazing atmosphere all the way from the descent from the Pavlič Pass and along the ascent and descent of the Volovljek Pass, where one of the largest groups of supporters was gathered. The winner of the Tour of Slovenia, Primož Roglič, was also impressed by the fans, saying that they gave him that extra boost across the finish line. Another award was presented to the destination that was the most innovative in using the opportunity to promote itself and the country to the domestic and foreign public. “At the STB, we have decided to present a special award to the destination that demonstrated innovation and passion to make sure that the world felt Slovenia.The award was given to Laško because of the I Feel Laško and I Feel Slovenia performances by 500 children, who impressed the global public,” said STB Director Maja Pak on presenting the award to the director of the sport, tourism, information and cultural centre of Laško Janja Urankar Berčon. The publication of both performances impressed the commentator of the live broadcast and also reverberated on social media. The STB shared the video with innovative promotion on the Feel Slovenia social networks. It generated more than 42,000 views and 800 likes and was shared by 250 people. To ensure the efficient promotion of Slovenia as a perfect tourist destination for sports events and active holidays, the STB bought advertising space in Eurosport media in the amount of EUR 190,000 (excluding VAT). With the advertising campaign which took place from 26 April to 20 June and the live TV broadcast, the promotion reached millions of people. From 13 to 19 June, TV Eurosport 1 and 2 produced approximately 34 hours of broadcast, 7.5 hours of which included the live broadcast of the race with images of more than 50 Slovenian landmarks. These reached more than 9.3 million of viewers around the world, while the promotional videos of Slovenian tourism reached 10.6 million viewers. Posts on social media also achieved a wide range of audience. One post on Eurosport’s Facebook page recorded more than 1.6 million followers in different languages, while the posts on the Feel Slovenia social networks (Facebook, Twitter and Instagram) related to the race were followed by 700,000 fans. Posts with the #ifeelsLOVEniahashtag exceeded 18 million in the last month, and posts from 19 May to 19 June with the #tourofslovenia hashtag reached additional 18 million people. “This year’s 25th annual Tour of Slovenia was exceptional in every sense. Through Eurosport television network social networks, we brought the I Feel Slovenia brand to the world and presented Slovenia as an amazing green country with friendly people and several landmarks worth seeing. Project partners and destinations have worked hard, but it was worth it. The atmosphere throughout all five stages was great, several surprising performances added to the attractiveness of the race and the promotion of Slovenian tourism. I would like to thank the Adria Mobil cycling club, race partners and destinations for the effort and creativity they invested. Some of the biggest global cycling stars such as Rafał Majka, Marcel Kittel, Mark Cavendish, Rick Zabel and, of course, Primož Roglič, who is also the ambassador of the race and Slovenian tourism, shared their enthusiasm for our country on social networks.His triumph at this year’s race was also the reason behind such an outstanding atmosphere,” said STB Director Maja Pak after presenting the awards in Novo Mesto. 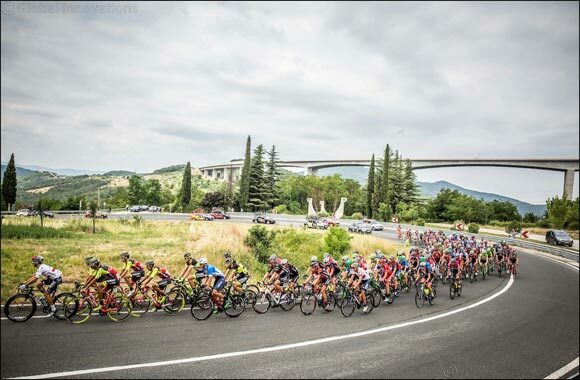 The cycling race took place from 13 to 17 June and included five stages: from Lendava to Murska Sobota, from Maribor to Rogaška Slatina, from Slovenske Konjice to Celje, from Ljubljana to Kamnik and from Trebnje to Novo Mesto. This year’s competition was one of the strongest races of the UCI Europe Tour series as it included a total of 22 teams – 9 World Tour teams, 5 professional continental teams, 7 continental teams and the Slovenian national team. After the race, the Lotto NL Jumbo team with the great winner and ambassador of Slovenian tourism Primož Roglič stayed in Rogla in Slovenia to prepare for upcoming races. During the nearly week-long tour, between 22 and 27 May, the Cycling Ambassadors of Slovenia got to know different parts of the country and enticed their social media followers to both visit Slovenia and see the cycling race. Also this year, the project was launched to additionally promote Slovenian tourism and the Tour of Slovenia race. Among 400 who applied to participate in this amazing journey through Slovenia, five influencers have been selected. During their stay in Slovenia, 30 videos in different languages were filmed, showcasing endless opportunities of active holidays in Slovenia. 700,000 people were reached on social media channels and videos got 25,000 shares. The total reach of all videos and other posts by the Cycling Ambassadors and the STB is estimated at more than 2 million people.